Dogs’ youngster Toby McLean is embracing his position as an older head in what’s been the League’s youngest side for five weeks running. Toby McLean is a creative small forward/midfielder with exceptional leap and marking ability for his size. Crafty around goal, agile and prolific ball-winner, McLean averaged 22 disposals from 20 games and kicked 32 goals in an outstanding first year in the TAC Cup. The 18 year-old was runner-up in the TAC Cup’s league best and fairest award, and was named best on ground in the Oakleigh Chargers’ TAC Cup Grand Final win in September over the Calder Cannons. McLean started his year as a forward, but forged his way into the Chargers’ midfield proving a crucial ingredient in their successful season, recording multiple 30+ disposal games. At the NAB AFL Draft Combine, McLean finished equal-third in the kicking test (27/30). McLean played a career-high 15 games in 2016, and was a part of the Club's AFL Premiership win in just his second season of senior football. 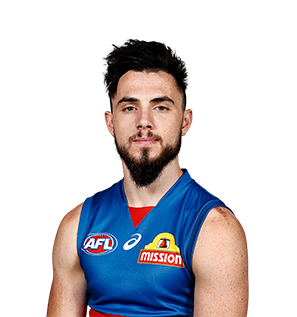 Toby McLean was one of two Bulldogs (the other was Jason Johannisen) to play all 22 matches this year. McLean led the Bulldogs’ tackles with 126 for the season, he averaged 5.7 a game (a career high), but also made improvements across his whole game. He finished 14th in the competition for total tackles and averaged 24 disposals per match. Toby McLean played 19 games in 2017. In a terrific third season for the midfielder, McLean’s best game came in Round 16 against Adelaide. McLean was the Bulldogs’ best player on the night with eight clearances, three inside-50’s, eight tackles and a career-high 32 possessions. 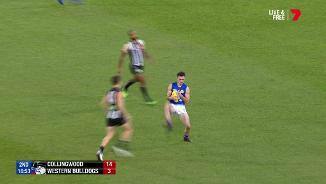 In Round 14, in the Bulldogs’ one-point victory over North Melbourne, McLean was among the best with six clearances, three inside-50s and 13 score involvements. Spending more time in the midfield in 2017, McLean averaged 22.4 disposals, significantly up on his 2016 season (17.3). “I thought I had a big improvement personally this year. “Moving into the midfield and getting more involved around the ball, it’s probably become my number one role this year, coming second to being a forward. I’ve really enjoyed it. Dangerous and creative around goal, by the end of 2016 Toby McLean had added eleven more games to his career tally and a premiership medal. Was a regular fixture in the Dogs' line-up in the first 11 weeks of the season before a foot injury sidelined the 20-year-old for the next two months. Returned via the VFL and showed glimpses and eventually landed back in the team for the semi-final against the Hawks. he averaged 20 disposals (nine contested), five tackles and almost a goal a game for the remainder of the season. Strong overhead for his size and will only get stronger with another pre-season in the gym, while his snap off a step is lethal. Kicked a goal in 11 of 15 games played this season. “I had a good start playing every game until round 11 and then obviously had that foot injury which didn’t help and I was out for six to eight weeks. Was good finishing off in the team. “You set yourself a few goals during the season - my fitness was a big one, especially knowing when to push the body that little bit more. “I think my kicking this year has improved a lot as well, my set shots, I sort of made the most of my opportunities. 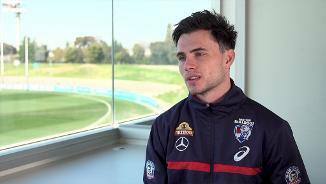 The Dogs top pick in the 2014 draft, Toby McLean impressed in his debut season. His high-flying marks and craft goals feature heavily in his game, as he began the season in the VFL. McLean made his AFL debut in round 10, starting as the substitute against Port Adelaide. His subsequent three games, where he played the full match in each, McLean averaged 19 disposals. 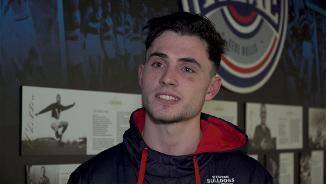 McLean unfortunately succumbed to a shoulder injury following the round 14 clash with Carlton, requiring surgery that kept him out of the game until Footscray’s finals series. Despite only a short time in the AFL side, McLean showed enough promise to convince he has an exciting future ahead. McLean collected 21 disposals in round 14 against Carlton, as well as six marks and three tackles. “It was a real shame he hurt his shoulder, that game where he got injured, he was one of our best two or three players on the night. He can play, he’s got great talent, he can take a great mark, but he’s also just got great footy nous.